Thanks to her distinctive, piercing vocal style, Ellie Goulding has been featured on dozens of soundtracks for movies and television shows, but judging by the arrow tattoo on her finger, she feels a connection with one movie in particular. Although Ellie had been planning to get an arrow tattoo for several years, it wasn’t until her song “Mirror” was chosen for the soundtrack of 2013’s Hunger Games: Catching Fire that the singer took the plunge and got an arrow tattoo on her finger. Arrows are pretty popular tattoo designs these days, but Ellie Goulding’s tattoo is unique because it is inked in white, which makes it extra discreet and also feminine. 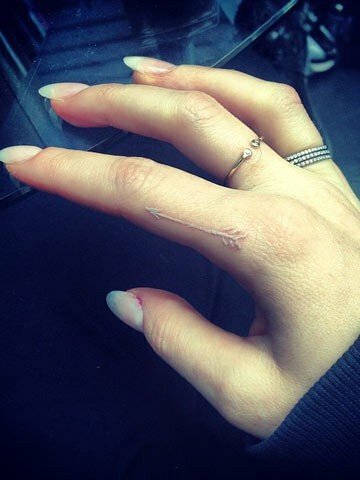 The arrow is also quite small, and is inked on the lower part of Ellie’s index finger on her right hand, in almost the same spot as her BFF Cara Delevingne’s lion tattoo. Back in May 2011, Ellie Goulding filmed a video at the Salvation Tattoo Lounge in South Beach, Miami, where she asked the tattoo artist to sketch a few different arrow tattoo designs for her. “I was thinking about getting an arrow – whether it be red, white, brown,” Ellie said. “I’d love to see some different kinds of sketches of different arrows. Because there are so many, I’d like to compare them.” Although Ellie left Salvation Tattoo with an arrow sketch that she liked, she didn’t actually get her arrow tattoo until two years later, in June 2013, and the design ended up being quite different than she originally imagined, probably thanks to the Hunger Games crew and Miss Katniss Everdeen. Where did these demons come from? The “girl who was on fire” in the second installment of Hunger Games, Katniss, is a pretty tough chick who wields a bow and arrow for most of the film, so it wouldn’t be surprising if Ellie Goulding opted for an arrow tattoo as a tribute to Katniss and the soundtrack that featured her vocals. Another song of Ellie’s, “Beating Heart,” was written specifically for the film Divergent, and the singer debuted a blackbirds tattoo on her collarbone in March 2014, inspired by Tris, another tough lead female character like Katniss. Ellie also collaborated with ex-boyfriend Skrillex on the song “Bittersweet,” which was featured on the Twilight: Breaking Dawn Part 2 soundtrack, but we’re hoping the pop star doesn’t opt for a vampire or wolf tattoo anytime soon!